Strava. What it's really all about. Lots of people whine about how Strava is destroying cycling, what with the whole “added competition” aspect and all. Or something. These people are of course entitled to whine as much as they want about whatever they want. 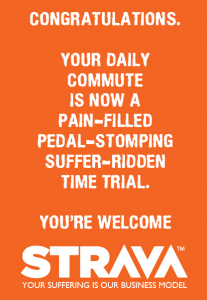 But the fact remains that Strava, and similar apps, are enormously valuable to cyclists, and not just competitive testosterone-driven street racers out for a new KOM. The key thing being the fact that your detailed data allows you not just to compete against others, but to compete against yourself. And even excluding the competitive aspect, it’s really quite nice to have a record of how many kms you’ve covered, how much uphill you’ve done and how often you’ve done it, and how much you’ve improved over time. And I’d be a whole lot slower and a lot less fit if I didn’t have some kind of self-challenging tool to kick my arse of a morning. 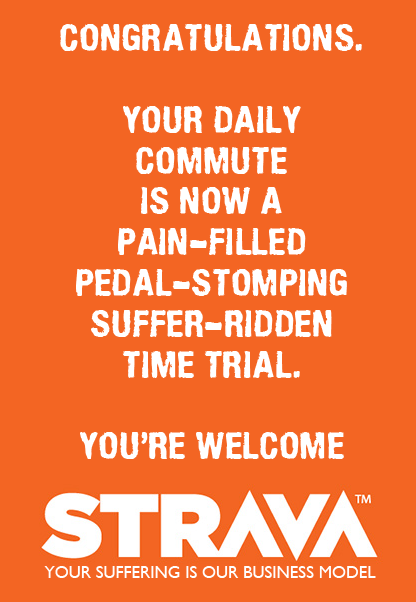 Or, to be more accurate, some kind of self-challenging tool that turns every commute into a gut-wrenching interval session. That said, there are things about Strava that piss me off. Royally.